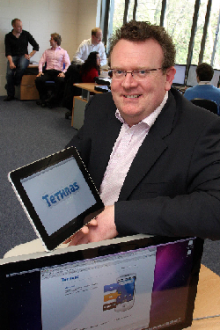 NovaUCD Incubator Companies Such as Tethras, the mobile app localiser service, will more than double in size over the next two years - pictured is Brian Farrell, founder and CEO of Tethras. NovaUCD, the Innovation and Technology Transfer Centre at University College Dublin (UCD), is claiming that its 37 incubator companies are set to create 300 highly-skilled jobs over the next two years. Professor Peter Clinch, Vice-President for Innovation at UCD, said the employment projection figures are based on the results of an annual employment survey of companies based at the centre, which have raised over €40 million in equity investment to date. Companies located at the centre include a mixture of “spin-out” companies, established by UCD researchers to commercialise the outputs of their research activities, and “spin-in” companies that have located to NovaUCD in order to interact more closely with UCD commercialisation activities and to avail of research expertise available at the University. Currently there are 205 people employed by the Nova companies. They created 80 jobs during 2011.